Designed to endure bail-worthy belay conditions on single-pitch winter routes and huge alpine faces alike, the Black Diamond Stance Belay Parka lets you hunker down while your partner battles it out on the sharp end. Their warmest insulated jacket, the Stance features two layers of lofty ThermoLite® insulation that provides serious warmth even when wet. A two-way zipper allows access to your belay device, and oversized hand, chest and internal drop pockets store gloves, water bottles and other on-route essentials. Stance Belay Parka - Mens is rated 3.0 out of 5 by 1. Rated 3 out of 5 by gearjunkie 101 from Not As Good As The Old Versions I have several insulated hoodies and jackets. Some for mid layers and some for outer layers over the shell jacket. After using the first version of Black Diamond"s Stance Belay Parka, I was totally impressed. It's for over the shell jacket. 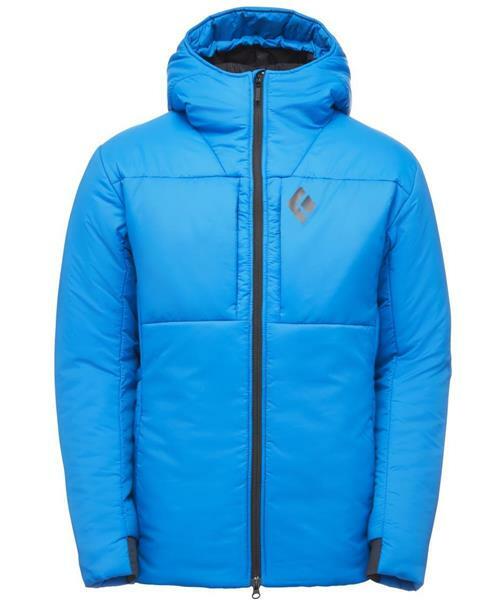 I bought it in 2013 and I believe it has the 180gm/m2 primaloft insulation. Thick and crazy warm. Love it. The next one I bought in 2014 and is half the thickness. I think it's 80gm/m2 primaloft. It's used as a mid layer. Both are excellent. After buying the new version using Thermolite and I must say it's disappointing. I had to return it. But like everything else these days, companies have been finding ways to cut costs and increase profit margins. Unfortunately, they will allow the quality to be compromised to stay in the game. I've seen companies replace quality materials with inferior ones. Also using substandard construction and stitching. And using less material in the previous model, eg. less material around the shoulders and arms just to save that 4% material cost over 1000 pieces, etc. And the latest excuse for the lack of durability is weight savings. ( excluding high end materials ). Ok, that was my rant ! In any case, I sure hope Black Diamond pulls up their pants. They were my favorite company for awhile. Now I'm buying more $$$ Arc'teryx these days.